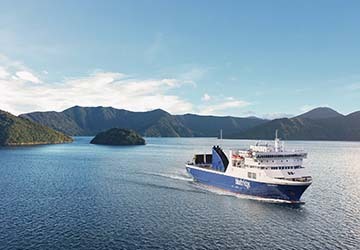 Bluebridge is the brand name of a popular and modern passenger ferry service operated by StraitNZ, connecting New Zealand’s capital city Wellington and Picton in the Marlborough region across Cook Strait. Bluebridge boasts two state-of-the-art vessels, both ships are equipped with design and safety features in addition to offering exceptional passenger comfort. Built in 1997, The Strait Feronia has the capacity to take up to 150 cars and 400 passengers. Prior to entering service in New Zealand, the vessel underwent a refurbishment of the public areas to meet the customers’ needs. 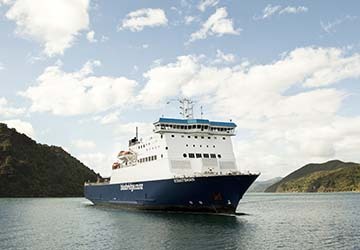 Bluebridge’s newer vessel is The Straitsman – the Danish designed and Dutch built and started running in 2005 which is known to be the most modern and eco-friendly ship sailing Cook Strait. On board the ferries, you’ll find various facilities including a movie lounge, quiet lounge, family area, café and bar providing variety of food and drinks, wifi internet and a viewing deck/lounge where you can see New Zealand’s finest scenery throughout the journey. There is also a selection of private cabins available ranging from single to family sized rooms for those who require increased privacy and luxury. Ferry crossings between North and South Islands run up to seven times daily, all year round and take around 3 hours 30 minutes. The delights of New Zealand's spectacular nature are now just a ferry trip away with Bluebridge. Use directferries.com to find Bluebridge timetables, prices and to book Bluebridge ferry tickets. Looking for the lowest fares for your destination? Don’t worry, we’ll also compare Bluebridge with alternative ferry companies.